It's been a little crazy around here. I'm hoping we can begin getting out the Christmas decorations and start enjoying this time of year! Perhaps we'll even get our Christmas tree this weekend. I'm ever so hopeful! We did take down all the Halloween (oops)/ Fall decorations this evening, so that's a step in the right direction....right? Part of my time at Starlight Farm, the barn with the indoor arena that Piety and Flurry are at, involves all of their care - this includes feeding/ mucking/ turning them out during the day. Throw in taking care of Topaz, Siggy and Zeus, not to mention continuing to work on other Akindale horses who are still at ATBR, and that's a full horsey plate with a side of mucking. So, it's been a little hectic. Saturday was supposed to be a quiet day, but involved two trips to Starlight, a ride on Zeus, grocery shopping, and probably a few other things I can't remember. It also involved a trip. And fall. 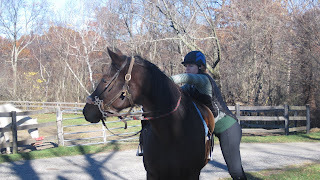 I managed to ride three horses gracefully that day, working all around them, handling some other horses....and as we were headed to the grocery store, I completely went arse over elbow and managed to biff on our basement stairs. Matt heard the "smack, thwap, bump, kaboom!" as my foot went right out from under me 5 steps from the bottom and I finally came to a rest on the floor. Apparently, Whimsy tipped him off - the ruckus scared her half to death so she flew past him and hid under the bed. I heard a tentative, "Uhhh, are you alright down there?" from above me. It could have been God. Probably not with the amount of cursing I was doing. Since then, my wrist has been completely sore and jammed up. This is the wrist I primarily muck with (which means incredibly deft pitchfork wielding), the one I brace against when dismounting a horse, the one I tuck under my pillow when falling asleep. Before I officially begin this post....Happy Birthday Mom! A year ago today, Matt and I officially moved into TMF. I can't believe it's been a year, it's just flown by, and I still feel like we haven't unpacked (and there are many many photos that have yet to be hung!). There are so many things we want to do still, and it's clear just how much a home is a work in progress. We've had comedy, tragedy, chaos and calm all in one year. 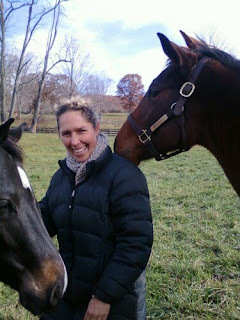 While I think most homeowners experience their first year just like we did, I can't help but think that ours was magnified by bringing the horses home, building a barn, and beginning a business within that year. We've had more emergency vet visits than we'd like to mention (though totally happenstance). Matt has dutifully put up fencing, then put up more fencing, then repaired some more broken fencing. 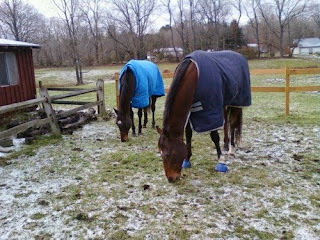 We learned to not operate the weedwacker when the horses are out (ensue chaos, followed by vet bill). We have carried hundreds of gallons of warm water from the house to the barn. We have also named our neighbors (who may or may not know how to read, so I'm sure they won't be reading this blog). We have the Weirdlys, the Rednecks, the Pool Feet House, and the Pyro House. We have some lovely neighbors who have come to our rescue and offered helpful tips about the area, so they don't have a funny name like the ones listed above. They have actually bothered to introduce themselves to us! Although our first year was wonderful and exciting in so many ways, I'm hoping that our second year at TMF brings about some calm, some tranquility, and with a year of experience under our belt, I think we'll get there. Now if only we could find out what the random switches and outlets in the house actually do, then we'll be all set! I hope everyone had a great Thanksgiving with their families! We had a lovely day, complete with leftovers from our turkey extravaganza that you all got to witness. Now that we're past that holiday and moving at a good clip towards Christmas, in case you didn't already know, it's about time we let the cat out of the bag. No, I do not have a bun in the oven! Instead, I have come onboard at Akindale Thoroughbred Rescue as Head Trainer and Adoption Coordinator. It's a job I don't take lightly, because it is a lot. At first, the sheer amount of horses that are on my "to do list" would grow daily, and that was really overwhelming. Now, a few weeks into it, I think we're moving into a routine and a schedule that works. I love that this job enables me to work with these amazing animals - some who haven't ever been ridden, like Paris - others pulled from kill pens, like Flurry - and a few who have incredibly successful lives at the track who are just chomping at the bit (literally) to learn a new skill and show the world they aren't one trick ponies. As part of this job, I'm lucky to move up to 10 of our horses in development to a barn about 10 minutes from our house that has an indoor arena - Starlight Farm. 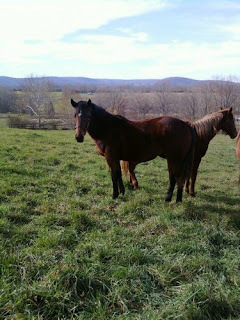 These horses will have the winter to hone their skills, really grow, and also be available to show to potential adopters. 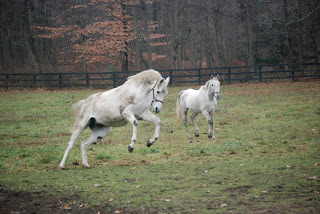 Some horses that you know are going: Flurry and Chief being two of them. 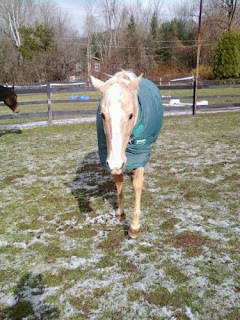 Speaking of our little Flurry - have you been wondering how she is? 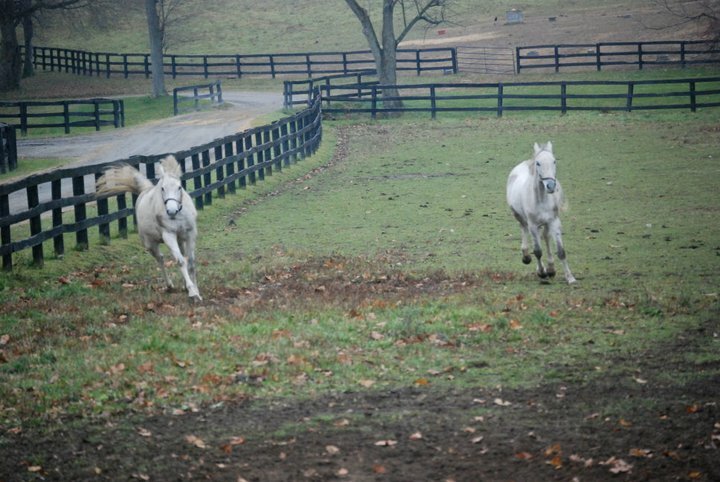 Well, she is just doing beautifully - loving her second chance at life, and enjoying her time in her new herd with her buddy that came from Camelot with her, Piety (who will also be going to Starlight). She's beginning to put some weight on and is just such a good girl. 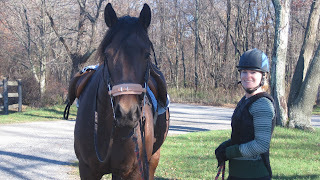 Earlier this week, I gave Flurry her first ride since the auction - and though she was a bit nervous, she was kind and happy to be under saddle. I cannot wait to see what she can do when we move to Starlight this weekend! Here's our girl, all decked out (and me bundled up in the chilly wind!). How beautiful is she? I am so very lucky to have the job of a lifetime. When I think about where I was a year ago - just closing on our home, still working in NYC...to where I am now, it's pretty mind-boggling. But I can't help but think it was all meant to be somehow. 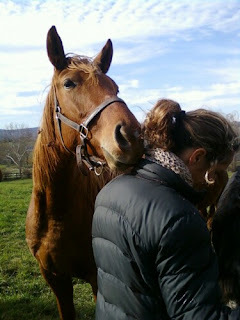 I should go out to the barn now and give Siggy a hug....because he is ultimately responsible for this new chapter! So here it is, Thanksgiving...the big day! Are you ready? Do you have an ample supply of elastic waistband pants handy? We've survived Tips 1-3. Congratulations on getting this far! Tip 4, though we're in the homestretch, is perhaps the most important. Tip #4...be thankful. We all have so many blessings, perhaps too many to count - both large and small. Whether they be people, animals, a roof over our heads or food on our plates, we should be grateful for what we have. And of course, who we have in our lives. 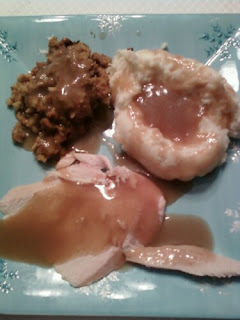 I happen to take Tip #4 literally and combine the two: being grateful for delish food and for the lives under our roof. Matt was traumatized by Tip #2 so he declined the chance to be photographed. 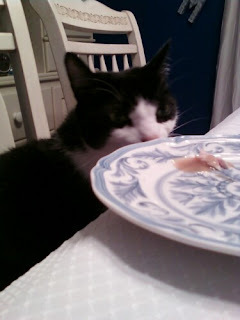 Monster, however, didn't mind at all, posing with his little serving of turkey and gravy. Have a wonderful, fun, and delicious Thanksgiving! Matt is calling around for therapists after his giblet experience. The neck was particularly fun. So, the turkey is in the oven, the Christmas music is going, and the next project is at hand. Here we go. Thanksgiving Tip #3...enlist help with potato peeling. You can see below what my help has been in past years. Look, they're friends. And I'm a lot happier peeling potatoes when I'm warbling a Christmas song with some Pinot under my belt. 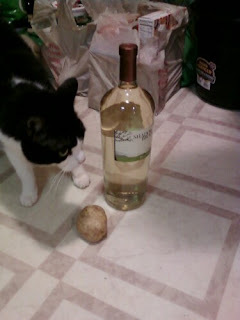 Knowing the wine wouldn't actually peel the potatoes for me, I called in for reinforcements. Here's Monster, who has no interest in the potato waiting for him, looking at Matt as if to say, "Dad, to I have to help Mom? She won't stop warbling Christmas songs and she expects me to work. Ew." You'll notice the wine was unopened at that time....it's because I had a different one in the fridge I had to finish. Oh and the groceries behind Monster that hadn't been unpacked. Priorities. This photo says it all. 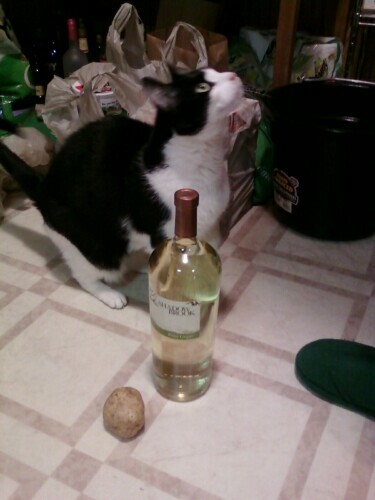 Monster, seeing the potato and fully understanding what is required of him, exits stage left. Le sigh. It's just you and me, Pinot. 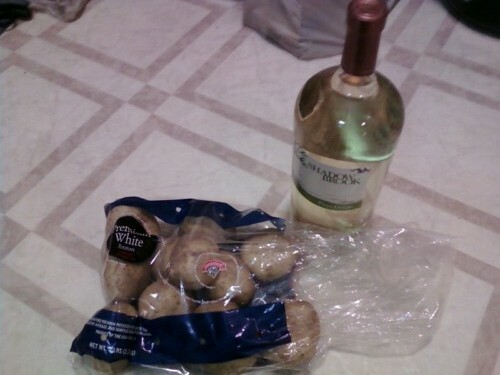 Pinot and potatoes. Warble warble. I am happy to report that the horse bucket trick worked! 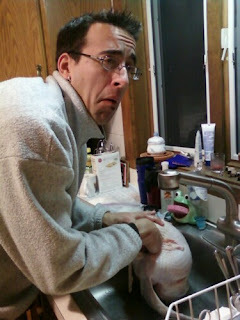 Our turkey that was supposed to thaw in 3 days time, actually thawed in about 7 hours. It took a few water changes, but while it soaked in the tub, I rode a horse, we went grocery shopping and had our Christmas card photo shoot done by the one and only Dennis Chunga. So, we'll move onward with our Thanksgiving Tips. Tip #2: Make someone else take out the giblets. Like your husband/ boyfriend/ girlfriend/ wife/ etc. You can see Matt is just thrilled at the chance to participate in this American tradition! Let's be honest here. If I monitor the turkey thawing, peel and make the mashed potatoes, make stuffing, gravy, and even remember to get the jellied cranberry sauce he loves so much, not to mention cook the actual turkey to perfection, he can do his part. While I snicker nearby with my camera handy. Now that's some holiday cheer for you! Over the next few days, I'm going to try and entertain you with some Thanksgiving Day tips. Now, whether these tips actually work or not, I don't know (will keep you posted). So far, I only have one tip, and it's a biggie, so I'm willing to share it with you! 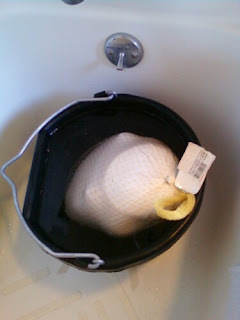 A 5 gallon horse bucket makes for a very handy tub to thaw your turkey if you're a dummy like me and forget to thaw it oh, 3 days beforehand. Duh. Special note: Matt just woke up. I heard him say in his sleep addled state: "Whoa." Then he sang, "There's a tub of turkey in the bathroooooooom, oh does it need a bath?" I think you get extra points if you leave the turkey in the bathtub (like the above picture) and let it surprise people. I should add that our turkey is 15 pounds. There is just the two of us. Warning: If you are faint of heart, do yourself a favor and don't read this post. If you're at work and don't want to get choked up at your desk, please wait until you get home to read. Trust me, you'll be happy you did. Today was a hard day, but one with a happy ending. It really brings home why we do what we do at Akindale. A little background: Evening Attire is a horse that resides at ATBR, and he is very well known in racing circles, having earned upwards of 3 million in his elite racing career. He is our "spokeshorse," and takes his role in greeting visitors very seriously. Frankly, there's no one better for the job! A few months ago, we got wind of Evening's brother, Tacticianor, who was in a kill pen somewhere in the middle of the country. He was pulled and was sent to a rescue closer to the auction, since he was too weak to be moved here. 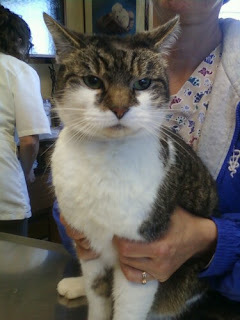 Here is a photo of him when he was pulled. Please be aware, he was starved - it's a tough image to look at. And he is just 6 years old. Unbelievable, isn't it? Makes you angry, doesn't it? In good news, Tac arrived at Akindale this morning - ready for the next phase in his new life - one where he'll be safe, well fed, and most definitely happy. 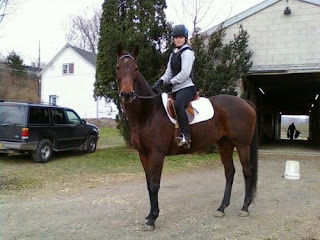 He still looks very, very thin, but in a few months, I'll do an update, and I promise you won't believe the difference. All following photos are courtesy of the uber talented Stephanie Cowser. Here, Erin looks over Tac. The grim expression on her face says it all. But I also see grit and determination there too. We all think Evening knew exactly who Tac was. 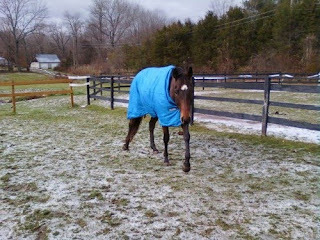 Tac was put in Evening's field, and as you can see, Evening was absolutely thrilled! For a little bit, Tac joined in on the fun - even after his long journey from Ohio. 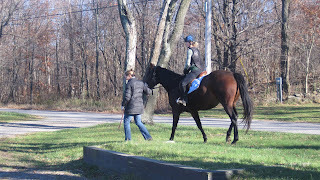 Later in the day, Erin and I went to a neighboring town to pull a starving horse that was adopted out. The woman who "helped" us load the mare into the trailer was upset that the horse pooped before loading, so she kicked the horse. It was sickening. The horse is now safe, in a lovely barn with people who will love her. And this - this is why we do, what we do. For the horses. They deserve lives of dignity, health, and happiness - just like we do. 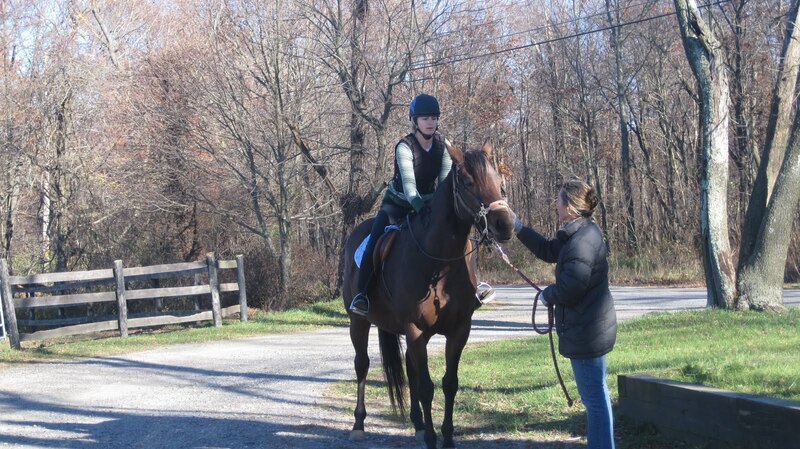 We do this for horses like Tac. This holiday season, if you have to shop for someone who has everything, consider a donation. We'll have donation cards sent out to those of you who do, and request a card. No amount is too small. 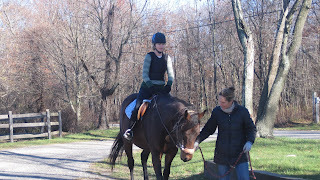 This is inspired by Cat E., faithful blog reader who donated to Akindale in lieu of a birthday gift for a family member. Thank you for reading this entry, and thank you all for being a part of this journey with me. Hello. I'm Mojo, and I'm mad. I'm taking over my mom's blog today because I need for you to understand what I have to go through sometimes. You see, I'm an explorer. I'm the Kitty Columbus of Wingdale. I have my own turf, that's all mine. But sometimes, other cats decide to invade my turf, and I have to defend it. My mom wants to throw rocks at the owners. But she's too nice to do that, so I got promoted to Head of Security at TMF. However, sometimes I end up with battle scars. Never being one to back down from a fight, I stick to the mantra, "Go big or go home." And this is why I have a hole in my head. Mom and Dad discovered it a few days ago and though they buzzed my head, cleaned it out and deemed, "Wow, it's really deep," they still insisted I go to the vet to make sure it wasn't worse than they thought. And so here I sit, angry at the world, with a reverse mowhawk and a week of antibiotics ahead of me. I'm back home now, but am being held hostage inside for 24-48 hours. Life is unfair, I tell you. I'm Mojo, and I'm mad. If you come to visit, make sure to bring me lots of treats and/ or live mice to torment. Life is hard when you've got a hole in your head. Let's have a talk. A talk about babies. Not just any babies. Behbes! Cute, sassy, curious and innocent eyed yearlings, that you just want to cuddle and smoosh and put them in the back of your Durango and let them live in your house. I get all goo goo eyed and start talking in nonsensical phrases when I see such young little lovelies. Look at them! 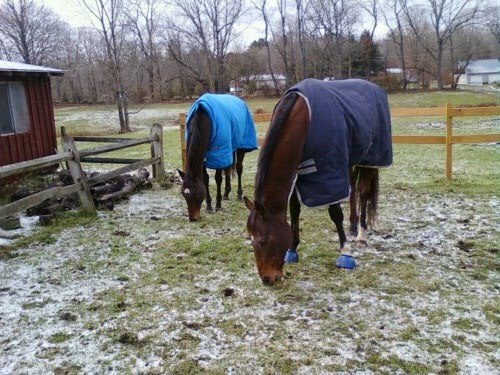 How do you not want to just snuggle with them and camp out in their field? 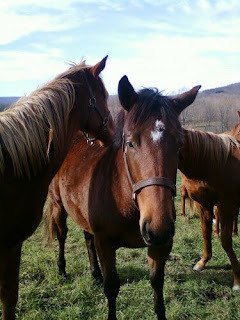 These are all little fillies - little girls - and a few are part of my Developing Horse program at Akindale. Two of them are actually 2 years old, but the rest are just a year. They are curious about everything, and will follow you anywhere. They will snuffle your hair down to your boots and look at you with such inquisitive eyes. 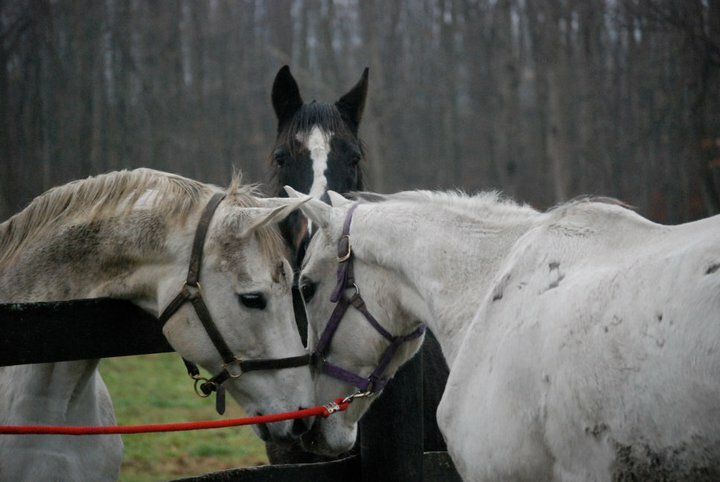 Here's one of them giving Erin a smooch. These little girls don't have a clue how nice their view is - they are happy with their acres of land, lots of grass and hay, and visits from people like Erin and I, who stare back at them, starry eyed with possibility. Happiness is horse snuffles. From behbes! I'll see you later. I'm going to Paris. After several months of working with Paris on the ground, having a few setbacks, and working our way back up again, it was time to finally sit on Paris for the first time. This photo looks like I'm calm and relaxed, above. And I am. After working with her for so long, I felt I knew her well enough and trusted her to be able to handle this for her first time. 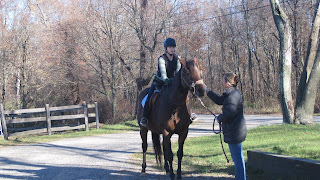 Erin, who was my groundperson, was a nervous wreck - but she did a marvelous job helping! Special thanks also goes out to one of my riding students, Marissa, who took these photos and helps me out at Akindale from time to time. 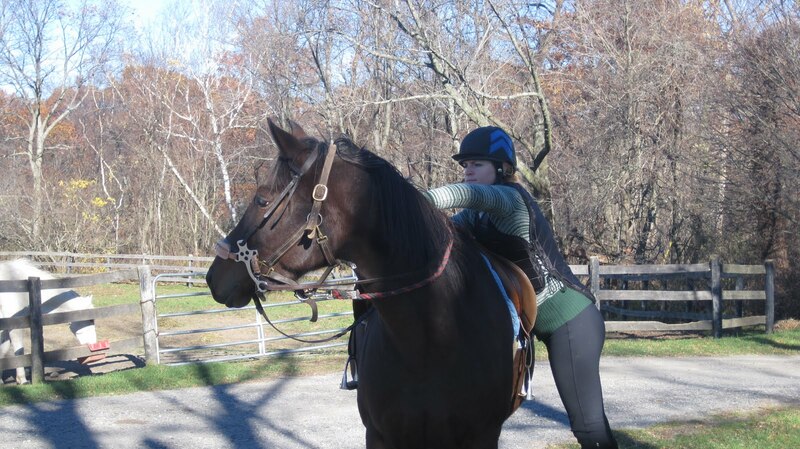 This was a really important moment - putting my weight across her back, testing the water, and basically making a ruckus on her back - tapping the saddle, flapping the stirrup leathers...and as you can see, she was interested but relaxed. And I'm on! Honestly, it felt like I was on top of the world. She took everything in stride, accepting my weight, my words and my signals. Erin helped her along in case she got confused or startled - she is quite big and therefore, really strong! For the last few moments, Erin was able to let me cue Paris through my hands and legs, which she responded to brilliantly. She's a smart cookie, our Paris. What a good girl. What possibility. Although she's a challenge on the ground and intimidates some people, I really feel that she has great things ahead of her. I am completely smitten with this promising young lady. I can't believe it. We've had snow already. I do love the snow (seriously). It reminds me of Christmas, sleigh bells, good tidings and being warm and cozy. It also means horsey snow angels, muzzles with icicles from snuffling around in the snow, and some extra playfulness from you know who. No, not Matt. 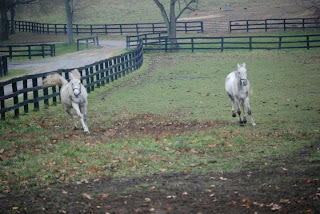 The horses! Here is Zeus yesterday, sporting his brandy new winter blanket, courtesy of his Grammy and Pop Pop DiCo, who contributed to it for my birthday. If you'll remember, none of my other blankets or sheets fit Zeus since he's very long - so he got all new duds to keep warm this winter. 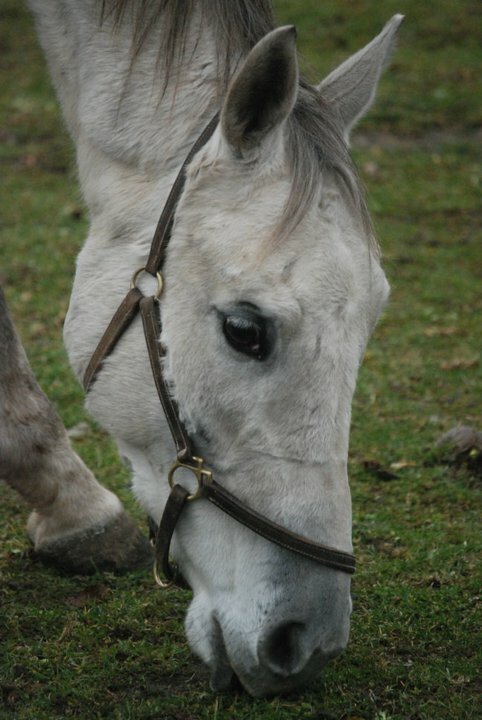 I love how blue it is - I can easily spot him in the field! I should add that even though we only had a dusting of snow, the gale force winds and already cold temps meant it felt about 25 degrees outside (as per the Weather Channel). 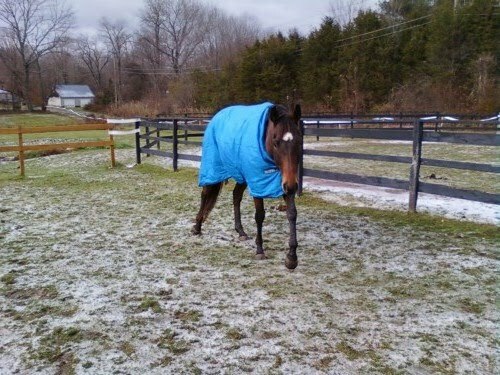 So winter blankets were a necessity! Siggy and Zeus immediately started playtime in the snow. 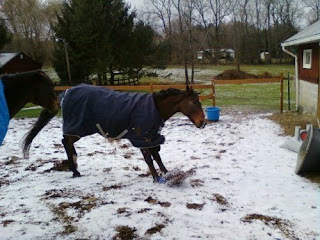 Here you can see Sig doing a wonderful sliding stop-and-spin that would make any reining horse proud. Please note both wheelbarrows on the right were knocked over - thank you 30+ mph winds! Topaz always looks so dignified in her blanket. She was none too amused with the antics from the boys, but seemed very happy and cozy in her plush rug. Ah, winter. We're ready for you. Bring it on! 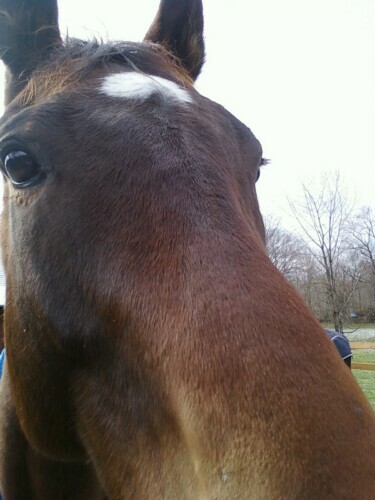 One last thing....a shout-out from Zeus to a very special Horsewife, Kim! Kim is laid up at the moment and sent me an email asking, "Where are the newest blog entries?!" Zeus agreed and wanted to send Kim a special snowy snuffle. It's been a hectic few weeks. 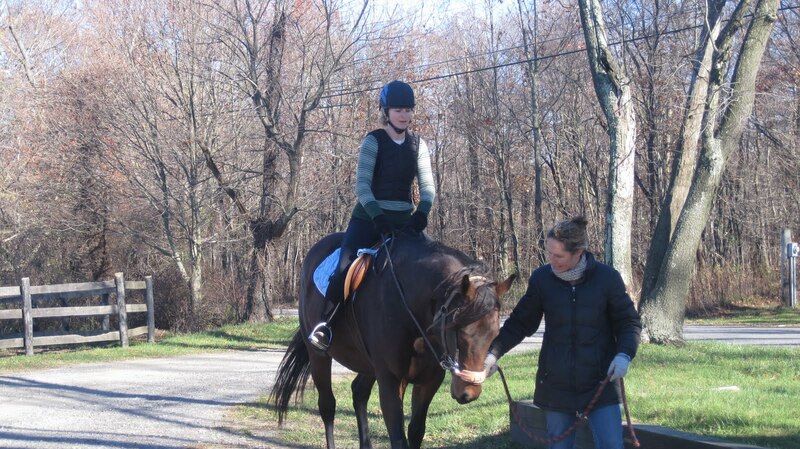 First off, remember the Woodbury FFA Hunter Pace Erin and I were going to ride Bank Me and Unique Dream in? Well, we did. It was yesterday, and it was cold! We were delighted with our horses, who were superstars. We were even more delighted with our third place finish, netting us two huge, beautiful yellow ribbons. As a bonus, we were also awarded a prize for Best Matching Adult Team, which was such a surprise and such fun! Our gifts were 2011 Calendars, lead ropes, and delicious cookies for horses (which Erin was ecstatic over, these particular cookies are soft and the elderly horses at Akindale love them!). The Woodbury FFA went over and above, and I was so proud to be a member of the Alumni. We'll hopefully get a photo of the two of us on course soon. Now that things are beginning to calm, I wanted to post some photos of events from the past few weeks for your viewing pleasure! It was a reminder of a great day and a huge day for Zeus and Siggy! Secondly, I wanted to share the professional photos from my very good friend Marisa's wedding. Marisa had a masquerade Halloween wedding at St. Clements Castle in Portland, CT. It was an unforgettable and unique wedding, and it felt like all of the other guests had become family and friends. The warmth, good tidings and ambience all made the day such fun. It goes without saying, but Marisa (a model) was one of the most beautiful brides I had ever seen, and that goes for all the brides in magazines, on television, and films. Her husband Chris, though quiet, had a look of adoration on his face all day long for his bride. Want to see for yourself? Click here to see the Masquerade Wedding Photos! We had snow this morning. Ready or not, here comes winter!